Our club members were happy to interact with local families at the Parsippany- Troy Hills Annual Fall Festival held on September 18th in Lake Hiawatha. A fun time was had by all! Club members getting prizes ready for the kid’s games at Parsippany’s Annual Fall Festival. From left: Jennifer Biondo, Janet Reilly, Joan Garbarino, Club President Marilyn Marion and club member Lora Rios-McBride. 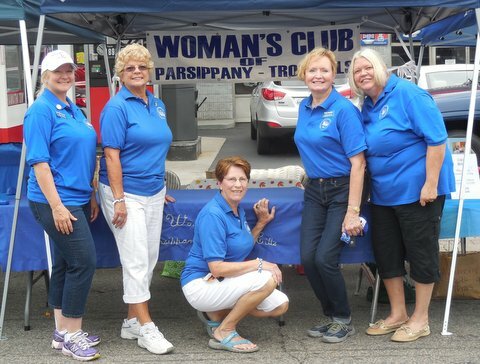 Club members after setting up Woman’s Club of Parsippany Troy Hills booths at Parsippany’s Annual Fall Festival. Fr left: Club memberJoan Biondo, club President Marilyn Marion, and club members Janet Reilly, Vicki Golden and Joan Garbarino. Club member Teri Wohld with two game winners. Club members after setting up Woman’s Club of Parsippany Troy Hills booths at Parsippany’s Annual Fall Festival. Fr left: Club member Janet Reilly, club President Marilyn Marion, and club members Vicki Golden and Joan Garbarino.